Even when Chris Matthews attempts to side with the conservative/Republican position on an issue, he ends up either bashing them or praising Democrats, something he did three times on Wednesday's Hardball. Later on Matthews appeared to defend tea partiers when he scolded Salon's Joan Walsh for using the term "teabag" which has a "sexual connotation" but just moments earlier accused conservatives of "leaping up and down orgasmically" over Scott Brown's win. Finally, he bashed Democratic Senator Bernie Sanders for comparing climate change skeptics to those who downplayed the Nazi threat in the thirties, as the MSNBC host explained: "One of the smart rules of politics is never...compare anything to Hitler." However Matthews couldn't help but take up Sanders' cause, as he accused those "who oppose climate change now do so, out of two motives...business and...anti-intellectualism, neither are defensible, when the victim of their position is the only planet we have." CHRIS MATTHEWS: Congressman Shadegg are you with the other Republicans who are putting out the word, in negotiations with the White House, that the President of the United States should not have a lectern tomorrow? Are you with that effort? Yeah he should sit at the table as the same level as you guys. Is that important to you?...Here's what I think Republicans are afraid of and then I'll let Congressman [Chris] Van Hollen speak. This is a, this was about optics I think, the question of whether the President should look elevated or not on television tomorrow. Here's a scene from the White House summit held one year ago, in an exchange between President Obama and the man he beat for President, Senator McCain. I think if you watch it you'll understand why the Republicans are sensitive about this kind of higher plane for the President. MATTHEWS: You know that format Congressman Van Hollen makes the President of the United States look like the principal of the school and John McCain -- who lost a pretty good election to him – like a third grader. Do you think it's a fair format, to have the President standing up there like God and the, or principal at least and the Republicans sitting there like pupils? MATTHEWS: Just two weeks ago you guys were leaping up and down orgasmically over, what's his name, Scott Brown winning and now he's being pushed out of the party. Three or four weeks ago, or a little longer ago you were jumping up and down about Chris Christie in New Jersey winning the governorship and Bob McDonnell winning the governorship, now these guys are being treated as like, "Oh they're not really one of us now." PAT BUCHANAN: Oh no look the guys are not purists. They're basically they're regular Republicans. You got a conservative Republican in Virginia. But look at Sarah Palin. She endorses McCain in Arizona. She goes to Texas and endorses the governor because that's a buddy of hers. She endorses Rand Paul who is a non-establishment candidate in an open thing in Kentucky. Chris you've had these battles in your party, you guys tried to dump your vice presidential candidate, Joe Lieberman. MATTHEWS: Why, why do you see Rush Limbaugh lamba sting Mitt Romney, who's probably gonna be your party nominee, I think if you look down the road, probably, it looks like it, for backing John McCain, your previous party nominee? I mean how can you be more regular than that? I like, well here he is. Here's Rush Limbaugh, going after. One thing about Rush he's always on tape. RUSH LIMBAUGH: I like Mitt Romney but I think he's risking his career over, over a guy endorsing McCain, who is so out of step with what's going on right now. It's, it's I mean well, McCain's, he's always conservative when he's running for re-election in, in Arizona. Well, you know, the, the tea parties have produced wave of conservatism that has swept Republicans In Name Only, aside. MATTHEWS: You know this reminds me of the old Democratic left. I know you might disagree with me Joan, because you occasionally do. November Doesn't Count. The NDC. The old New Democratic Coalition. All they cared about was who won the primary. Happily nominating people that couldn't win general elections. It looks to me like the Republican Party is, is really is creating a pup tent. JOAN WALSH: SALON.COM: Well they are. They're trying to fit the whole party in, into a tea bag, at this point Chris. And you know I want, I want to talk to my friend Pat who is sounding very reasonable a couple weeks ago when we, when we talked. He was defending Scott Brown. MATTHEWS: You guys will not stop! It's the Tea Party movement! It's not the Teabag movement. I know the sexual connotation that's only weird. But why do you guys keep calling it the Teabag Party? WALSH: There's no sexual references here. My Lord! MATTHEWS: Okay alright, alright, alright. My Lord. Okay. Incidentally on Monday's Hardball Matthews, himself, used the teabag terminology when referring to John McCain's primary challenger J.D. Hayworth: "Finally, revisionism at its finest, today comes courtesy of John McCain who's clearly feeling the heat from primary challenger and party teabagger J.D. Hayworth." 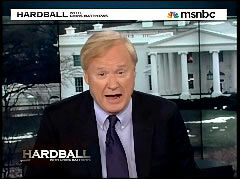 MATTHEWS: Back to Hardball. Now for the Sideshow. One of the smart rules of politics is never, never, repeat never compare anything to Hitler and the horror that he wrought on this planet. Well that's what Senator Bernie Sanders of Vermont has just done. Yesterday he compared climate change skeptics to those who downplayed the threat of Nazi Germany in the 1930s. Here he is talking up the need for climate change action at the budget hearings for the EPA. SEN. BERNIE SANDERS: The reason that this debate is so important is that it reminds me, in some ways, of the debate taking place in this country and around the world in the late 1930s. And during that period, with Nazism and fascism growing, a real danger to the United States and Democratic countries all over the world there were people, in this Congress, in the British Parliament saying, "Don't worry! Hitler is not real! It'll disappear. We don't have to be prepared to take it on." MATTHEWS: Well the people who do oppose action on climate change right now do so, not out of ignorance but out of two motives. I think one is business and two is their anti-intellectualism, neither are defensible, when the victim of their position is the only planet we have.